Wash set his empty shot glass on the bar and caught the man's eyes. "The railroad is willing to negotiate." "Maybe. But Miz Nicolet isn't." He pronounced the name with a long "a" at the end. Nicolay. "You know that for a sure thing?" The barkeep shrugged. "She hasn't given in on one single thing in the four years since she settled here. Real stubborn woman. Frenchie, you know. Worst kinda female on the face of the planet." Wash quirked an eyebrow. "Why's that? Because she's French?" "Because she's female. A woman don't belong out here, farmin' on her own. Plus that woman don't allow nuthin' anywhere near her place, not even Fourth of July picnics." Wash shifted, hooking his boot onto the bar rail. "That's a railroad right-of-way her farm's sitting on. Railroad wants to use it." "Huh!" the barkeep spluttered. "Railroad got a few hundred soldiers to back you up?" "Nope. They got something better - me. I'm a lawyer." The red-haired man again swiped his cloth over the bar. "No fancy law-spoutin' Back-East lawyer's gonna make a dent in that woman's spine." "I'm not a fancy Back-East lawyer," Wash said quietly. "And it's not her spine that interests me. It's her fence posts." All Wash knew about France was that Napoleon was a big overgrown bully and the wine had bubbles in it. Didn't seem to him that a woman, even if she was French, could be too big an obstacle. If she was halfway intelligent he'd simply point out the advantages the rail line would bring to Smoke River. And if she wasn't intelligent, well then he'd have to maneuver her into relinquishing the right-of-way the railroad needed. At his left, Rooney downed a second shot and when he could draw breath, smacked his lips. "Damn good stuff, Wash. Thanks." "Don't know how you could tell, it went down so fast." Wash rolled three two-bit pieces down the shiny wood bar and together the two men stepped out into the fading sunlight. Wash grabbed the reins of the black gelding and swung up into the saddle. "Gonna ride out and take a look at the narrow end of the valley." Rooney chortled. "You mean take a look at the lady farmer at the narrow end of the valley." "Just reconnoitering the enemy. You coming?" The stocky man turned back toward the saloon. "Nope. Rather stir up a poker game 'stead of a hornet's nest. That's your department." Yeah. Hornet's nests were his specialty. That's what he'd dealt with in the War and later the Sioux at Fort Kearney. And that's what Grant Sykes paid him for now. He reined away from the hitching rail and headed the horse past the whispering maple trees toward Green Valley. When he got to the overhanging cliff, Wash reined in. 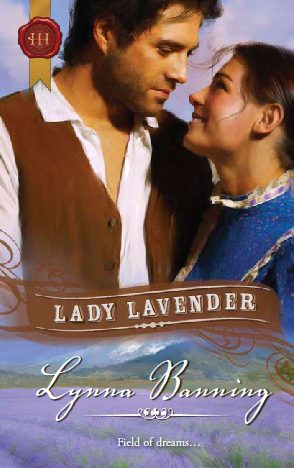 Below him stretched an undulating sea of lavender, washing up the surrounding hills like a purple tide. The little farmhouse nestled at the neck of the valley, a long, slim island of green surrounded by hills as brown and dry as old tea leaves. A peaceful place. He guessed few travelers passed by and those that did kept their horses on the narrow pathway to avoid trampling the purple-topped bushes next to the lane. Wash had to chuckle. Patches of bright green mint grew along the edge, so if a horse strayed off the path, the sharp minty scent alerted the rider. Miz Nicolet must be one canny farmer. He wondered for the 20th time why Sykes's railroad had purchased a right-of-way through this narrow valley. He guessed back then it was the only land the Oregon Central could acquire at a favorable price; the government had set aside the rest for homesteading. Below him, a movement caught his attention, a flutter of blue swirling across the ocean of purple, a woman running, her apron crushed into one hand, bare legs flashing. She slowed and pointed up at him, then began wading through the field, shouting something. He spurred the horse, stumbled down the steep edge through crumbling shale that shelved off under the mare's searching hooves. He shifted his weight to help the animal balance, and when reached the level valley floor he bent forward, his eyes narrowing. The tall patch of lavender just outside the weathered split rail fence twitched. His horse tensed and stood still, neck quivering. Wash laid a reassuring hand on the mare's warm hide. "What is it, General? You smell something?" The black stood motionless, then took a cautious step forward. Something scrabbled inside the little stand of lavender, and the bushy fronds waved back and forth. "Jackrabbit, maybe," Wash murmured. He drew the Colt from his waistband. Too close for a rifle; make mincemeat instead of supper. Another wriggle and Wash fingered the hard metal trigger. "Okay, girl, let's flush it- " On the word "out," he kneed the mare forward and aimed just left of the jiggling patch. If he guessed right, the critter would exit just in front of General's front hoof. He waited. The horse settled a leg on the dark earth and a high, thin cry came from the bushes. A small girl popped up, a little sprite of a thing, with two red-gold braids and a grimy white pinafore. "I am not a jackrabbit," she announced. "I am an ant-eater." She stuck out a tiny hand and unfolded it to reveal a smear of squashy-looking black stuff on her palm. "You eat ants?" Wash asked. The small hand closed up tight. "They taste like peppermint. I eat grasshoppers, too, but they wriggle. Do you like ants?" He studied her. Bits of dry grass were stuck in her hair, and her sunburned nose tilted up as she gazed at him. "You gonna shoot me?" "No, I never shoot little girls. Only jackrabbits." He started to stuff the Colt back in his holster when a blur of blue hurtled over the fence and plunged through the lavender patch. The spicy scent wafted on the still afternoon air. The woman planted herself in front of General, breathing hard, and the horse shied. "Don't touch her!" she screamed. She grabbed the child and shoved her behind skirts. "He wasn't gonna touch me, Maman," came the high voice from behind the blue skirt. "He was gonna shoot me." The woman's face went dead white. "Oh, no, ma'am, I wasn't going to - "
"He was, too, Maman. He was going to shoot me and eat me for supper!" "I was not," Wash protested. "See, I thought she was a jackrab - "
"Do not bother to explain, monsieur. Just turn your horse around and go." "Now, wait a minute. Let me ex - "
Jesus and Joseph. Her eyes snapped. Magnificent eyes. Like two shards of teal stone flecked with grey. Eyes that made his heart stutter. He studied the rest of her as she stood panting before him. Slim. Small waist. Couldn't tell about her hips under all those petticoats, but her breasts, rising and falling as she struggled for breath, looked lush and rounded. His mouth went dry. It had been a long, long time since he'd admired a woman's breasts. He wrenched his gaze from her bosom. Her face had a smattering of freckles over a sun-browned nose and a soft-looking mouth the color of ripe raspberries. A wide-brimmed straw hat hung down her back, the blue ribbon ties knotted about her throat. Wash cleared his throat. "You Miz Nicolet?" "That is none of your business," she snapped. "Leave my land this instant!" "Ma'am? Just listen a min - "
"And do not come back!" Wash figured if he stayed until sundown, he'd never get to complete a sentence. "Well, now, I can't exactly promise - "
The woman spun, scooped her daughter into her arms and tramped away toward the house, taking long strides that kicked up her petticoats to reveal mud-caked black leather workboots. Over her retreating shoulder the little girl grinned at him and waved an ant-stained hand. "Goodbye, monsieur! I hope you find something to eat." Something to eat sounded like the balm his shaken confidence needed. Better yet, something to drink. He guessed Rooney would still be dealing cards at the Golden Partridge; maybe he could rustle up a steak and some beans before they figured out his partner was cheating. "Come on, General." He headed the gelding down the narrow wagon trail toward town. "Wouldn't be the first time a woman hasn't liked what she saw of me right off," he muttered to his horse. "But sure as hell's the first time a woman's ever plain damn run me off. Not good for a man's spirit."